This article is about biggest airports in Europe. London airport, opened on 1946 and later it renamed as Heath-row Airport on 1966.It totally covered of 1,227 hectares. Recent achievements: In 2014, it handled a record 73.4 million passengers, a 1.4 percent increase from 2013 and also the 3rd busiest airport in the world. Recent achievements: It served over 51 million passengers in 2013, making it the 17th busiest airport in the world in terms of total passenger traffic and the 10th busiest in the world in terms of international passenger traffic. It was Europe’s 4th busiest airport in 2014. Paris north airport started in 1966. The airport opened and renamed as Charles de Gaulle Airport on March 8, 1974. It totally covered 3,238 hectares of land. Recent achievements: In 2013, the airport handled 62,052,917 passengers and 497,763 aircraft movements, making it the world’s eighth-busiest airport and Europe’s second-busiest airport in passengers served. It also is the world’s tenth-busiest and it is Europe’s second-busiest airport in aircraft movements. The base opened as a German commercial airport in 1936.The Frankfurt Rhein-Main Airport and Airship Base was officially opened on 8 July 1936. Recent achievements: In 2013, the one of the busiest airport in Europe by cargo traffic. As of winter 2012/2013, made the airport with a most international destinations in the world by the service of 264 destinations in 113 countries. Schiphol opened on 16 September 1916 as a military airbase. Recent achievements: In 2013, the airport ranking the amsterdam airport as Europe’s 5th busiest airport and in the passenger traffic it placed as world’s 14th busiest airport. The airport opened on 1928, and has grown to be one of the most important aviation centres of Europe. This the main international airport presented Madrid in Spain. Recent achievements: In 2013, the Madrid–Barajas passengers are over 39 million, users made it as the country’s busiest and largest airport, and sixth busiest in Europe. 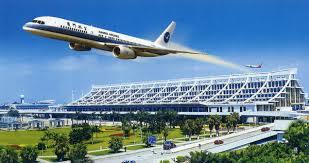 The building was started in 1980.it is opened on 1992.The area covered by the airport was 1570 hectares. Recent achievements: As of March 2015, the airport features flights to 228 destinations in 66 countries. The airport was officially opened on 15 January 1961, with two runways. It totally covered 2900 hectares. Opened on 1958.It covered 19.77acres. Recent achievements: In 2014, 38.1 million passengers passed through the airport, a 7.5%increase compared with 2013. Barcelona’s first airfield, began operations in 1916. Finally so a new airport at El Prat opened in 1918.the area covered from 844 hectares to 1533 hectares. Recent achievements: In 2014 Barcelona Airport handled a record 37.5 million passengers, up 6.7% from 2013.